The design of mammographic X-ray equipment stretches X-ray measurement technology to its limits. 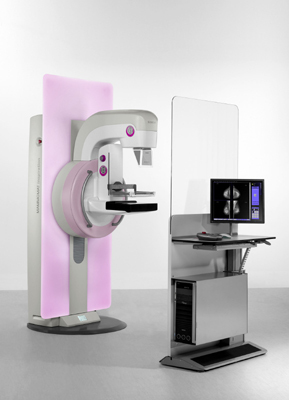 And consequently QA for mammography equipment requires specialised equipment and expertise. RPC has provided physics support to the NHS Breast Screening Programme, in South West London, since its launch in 1990. We are also very pleased to support the National Training Centre by providing teaching for their educational programme. RPC has a full range of the necessary test equipment and are continually developing our expertise to cater for the latest mammography technologies. We also support over ninety other mammography units throughout the UK. RPC can provide the same level of support to all departments that use mammographic x-ray equipment. A full programme of quality assurance checks in accordance with the requirements of the NHS Breast Screening Programme and the recommendations laid out in IPEM Report 91 : "Recommended Standards for the Routine Performance Testing of Diagnostic X-Ray Imaging Systems". Assessment of patient dose and image quality, setting of local DRLs. Advice on radiation protection requirements. Advice on the design and layout of new and existing mammographic X-ray facilities.